I was going to post something super healthy today, but being Friday thought better of it. You know you want a treat and SO DO I. So I’m making cookies and taking the weekend off! 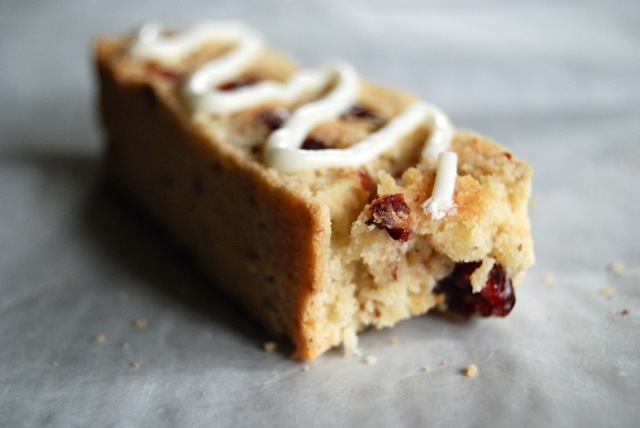 These biscotti have nuts & dried fruit so they count as health food (even with the white chocolate). 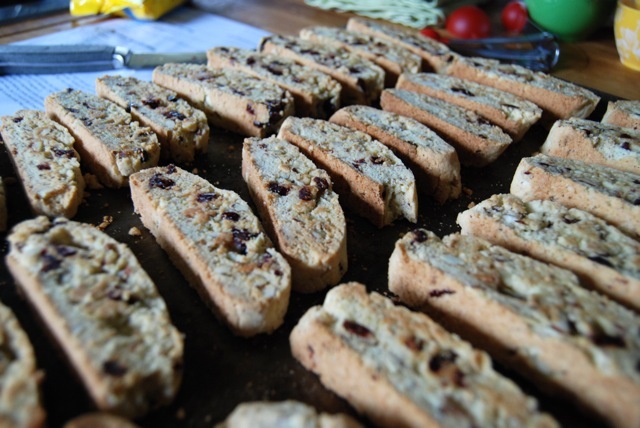 And they are seriously the BEST BISCOTTI I have ever tasted – and, as you can imagine, I’m not one to push the biscotti tray away. Use freshly grated orange zest if you can, but if you don’t have any, substitute a teaspoon of pure orange extract. If you’re rolling your eyes at the combination of orange and almond – JUST TRY IT. Out of this world. 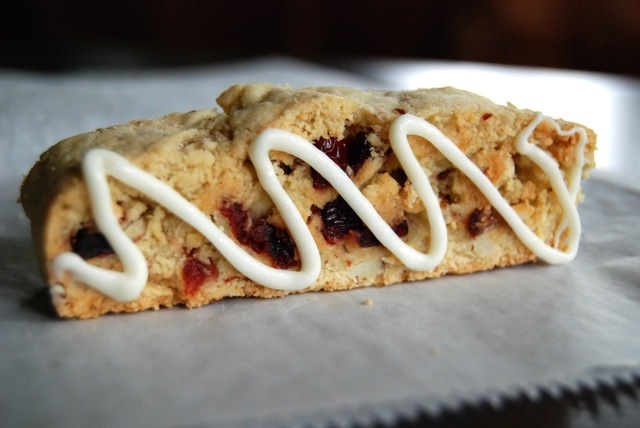 Much like the Orange Cranberry Cookies I concocted, the bright citrus brings out the very best in the chewy cranberries. They’re so addictive, you may find yourself having to hide the cookie jar. Recipe adapted from Hay Day Country Market Cookbook. In a large bowl, cream together the butter and sugar, beating until light and fluffy. Add the eggs, orange zest (or extract) and almond extract and mix until smooth. In another bowl, whisk together the remaining ingredients, save for the almonds. Add to the wet mixture, mixing just until the dough forms and pulls away from sides of the bowl. Then stir in the almonds. 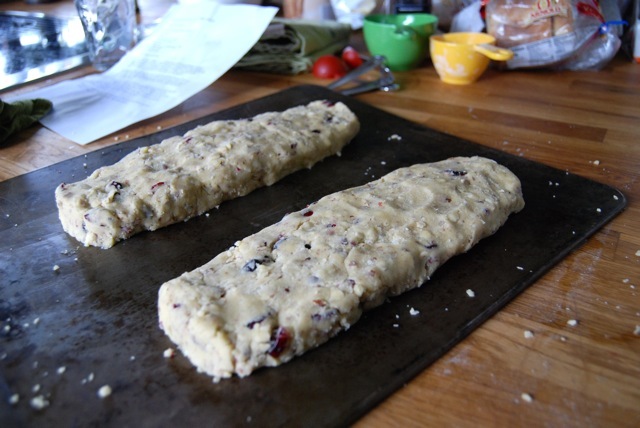 Divide the dough in half, and using your freshly washed & lightly floured hands, form each half into a 12 x 3 inch flattened log. Place the logs onto an ungreased baking sheet, spaced at least 2 inches apart. Place on middle rack in oven and bake until firm, lightly browned and cracked on top, 25-30 minutes. Remove the baking sheet from the oven and reduce oven temperature to 300 degrees. Allow the logs to cool on baking sheet for 10 minutes. Then carefully loosen them and remove to a cutting board. Using a thin sharp knife, cut the logs into 1/2-inch slices. Return the slices to the baking sheet, laying them cut side up. Return the baking sheet to the middle rack in the oven. Bake, removing the pan midway through baking time and flipping the cookies to ensure even browning, until the biscotti are dry and firm throughout, 20-25 minutes. Remove the sheet from the oven. 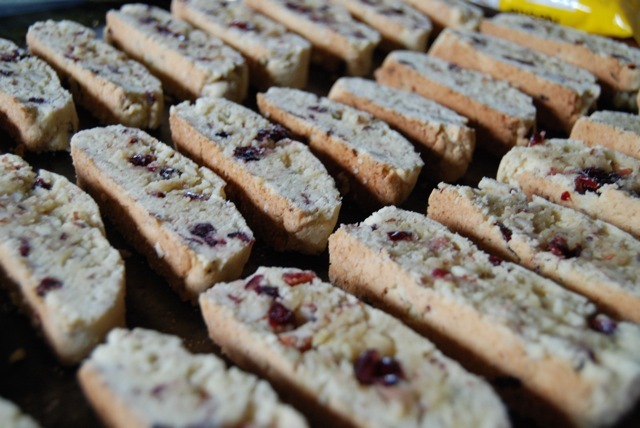 Place the baking sheet on a wire rack to cool and allow the biscotti to cool fully on the sheet, at least 30 minutes. After the biscotti have cooled, apply the finishing touch. Place the white chocolate chips in a microwave-safe bowl and heat for a minute. Remove bowl and stir chips until melted and smooth. Spoon melted chocolate into a disposable plastic bag and squeeze into one corner. Snip the tiny corner off and pipe the chocolate onto the biscotti. Allow the chocolate to harden fully before removing the biscotti. Store in an airtight container. 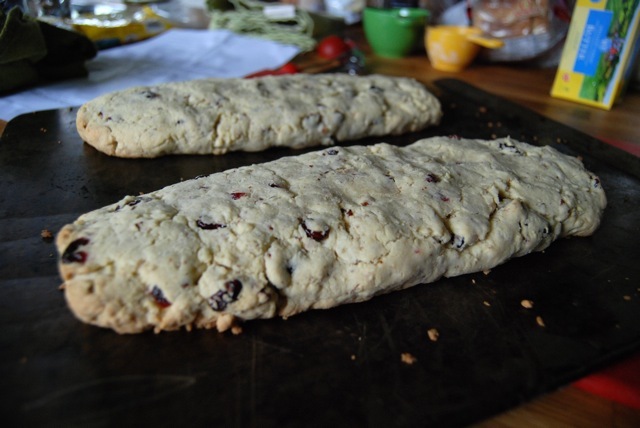 This entry was posted in Cookies and tagged best biscotti ever, Hay Day Country Market Cookbook. Bookmark the permalink. My husband just got home and reminded me of something. 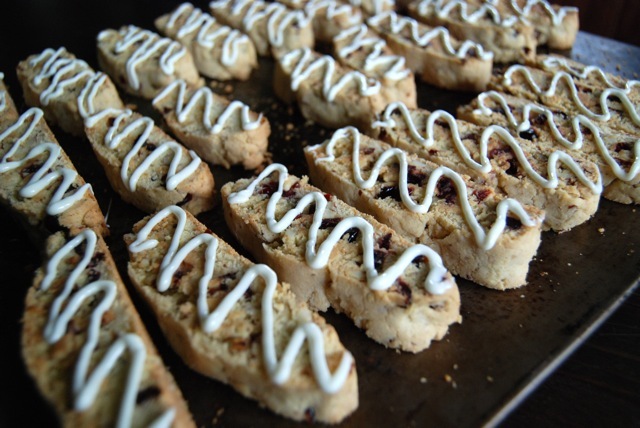 He offered one of these to a co-worker who absolutely LOVED it & said she normally doesn’t like biscotti. So I just wanted to say — if you are someone who shies away from biscotti normally, please give these a try. I guarantee you’ll look at biscotti in a whole new light! I really like the combination of orange & cranberry. This looks really good. I think you’re going to love these. PS: How weird about blogger losing your post?! Off to check and make sure it’s still there! Happy weekend, Shambo.